Proposition 30, approved by voters in 2012, provided critical revenues to California at a time when the state faced daunting fiscal challenges. These revenues increased school funding and allowed for reinvestment in other public services after years of cuts. Prop. 30’s tax rate increases are scheduled to expire over the next several years. Although the state is in a much stronger fiscal situation now than it was in 2012, the phasing out of Prop. 30’s revenue boost would mean fewer resources available in the coming years to fund California’s various priorities. This Issue Brief is the first of a two-part series in which we discuss what Prop. 30 has meant for California, and what extending a key component of it, as proposed by Prop. 55 on the November 2016 ballot, would mean for the state. What Did Proposition 30 Do? The PIT and sales tax rate changes enacted by Prop. 30 have increased state revenues by $7 billion to $8 billion annually, with somewhat smaller gains projected for later years due to the expirations of the sales tax rate increase in 2016 and of the PIT rate increases in 2018. 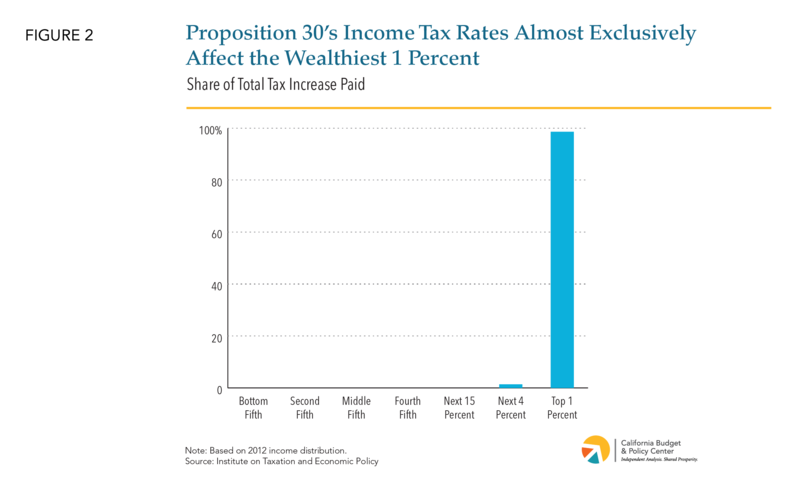 Whose Taxes Does Proposition 30 Affect? Prop. 30’s quarter-cent sales tax rate increase affects all consumers. However, as a share of income, this increase has a larger impact on lower-income households than it does on higher-income households (Figure 1). This makes the tax “regressive,” as opposed to a “progressive” tax, which does the opposite — ask more of higher-income households than of lower-income households. Prop. 30’s PIT rate increases are aimed at the highest-income households. Prop. 30’s PIT rates affect “roughly the 1.5 percent of taxpayers with the highest incomes,” according to the Legislative Analyst’s Office. Of the total annual dollar increase in income tax revenues raised by Prop. 30, the top 1 percent of households pay 98.6 percent, with the remainder paid by households in the next 4 percent, according to the Institute on Taxation and Economic Policy (ITEP) (Figure 2). Prop. 30’s PIT rate increases are very progressive. The revenues from Prop. 30’s higher PIT rates ($6.7 billion in 2015-16) are more than four times the revenues raised by the sales tax rate increase ($1.5 billion in 2015-16), according to the Department of Finance. 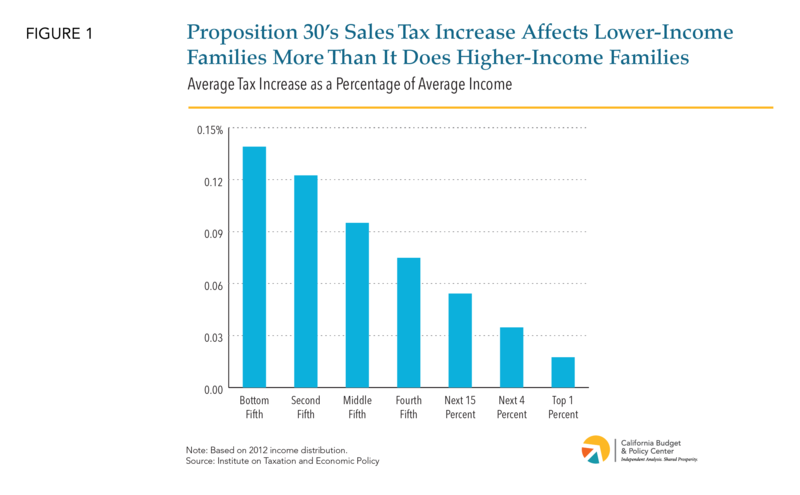 This means that even though the sales tax component is regressive, Prop. 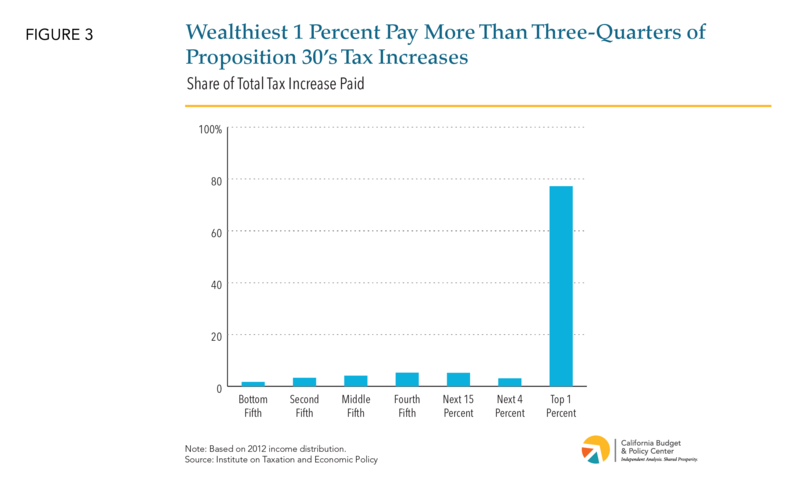 30 overall has a progressive effect on California’s tax system. Of the total revenue increase due to Prop. 30, the top 1 percent of families pay 77.2 percent, according to ITEP (Figure 3). Asking the wealthiest Californians to contribute more follows the “equity” principle of taxation: that taxes should be levied fairly and based on ability to pay. 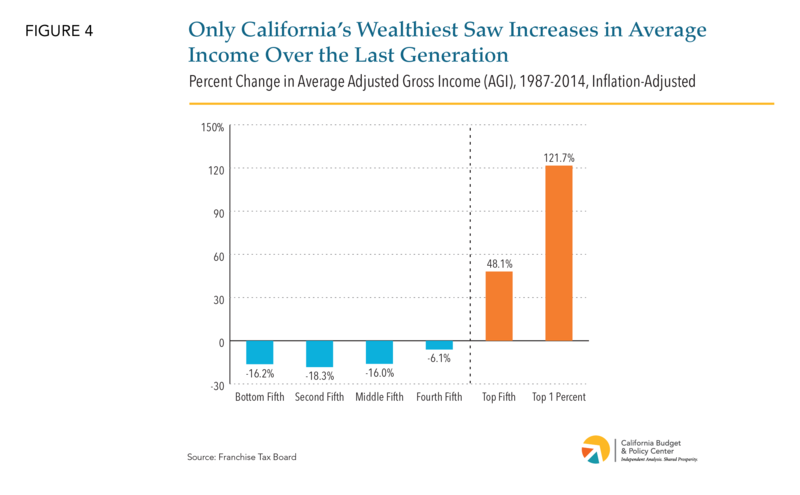 Furthermore, the wealthiest Californians were the only ones to see growth in their average incomes over roughly the last quarter-century. The bottom 80 percent of Californians actually saw their average incomes decline between 1987 and 2014, after adjusting for inflation (Figure 4). Helped the state to reinvest in preschool, K-12 schools, and community colleges. A growing economy and Prop. 30 worked together to boost Prop. 98 K-14 spending from $47.2 billion in 2011-12 to $71.9 billion in 2016-17. Since voters passed Prop. 30, Prop. 98 K-12 spending per student has increased by more than 14 percent — from $9,168 per student in 2012-13 to $10,493 in 2016-17, after adjusting for inflation (Figure 5). 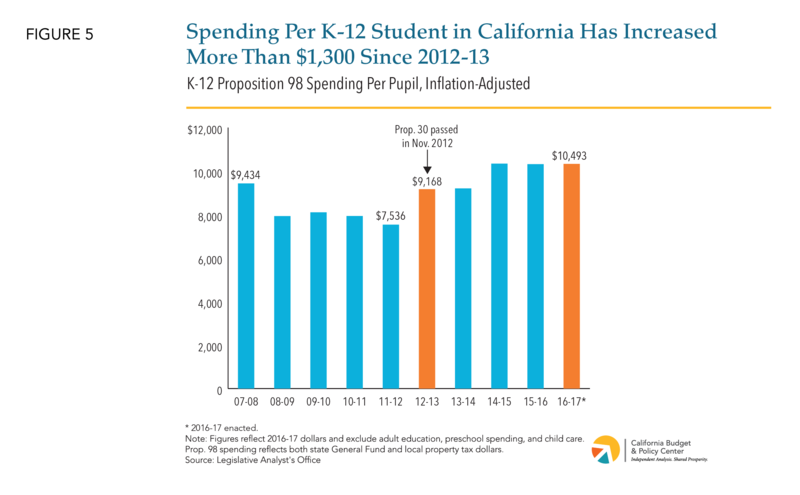 This increased support for California’s students followed a significant reduction in funding during and after the Great Recession. 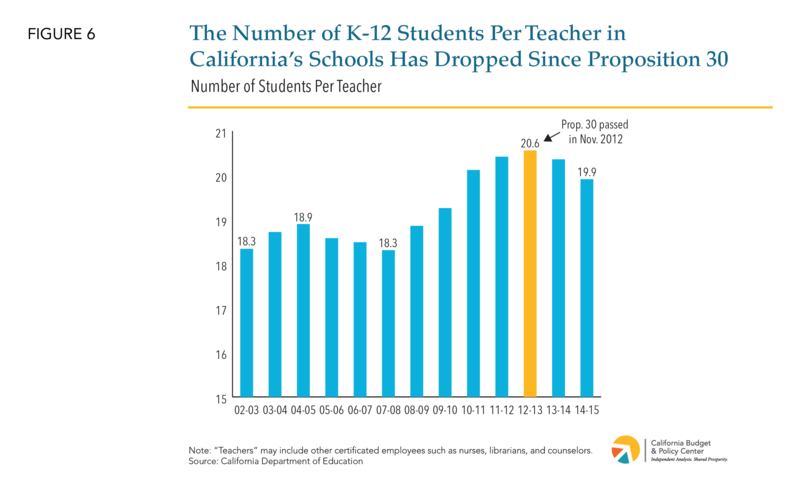 Furthermore, the average number of annual instructional days in California schools has increased and the number of K-12 students per teacher in California has decreased since voters approved Prop. 30 (Figure 6). Allowed for some reinvestment in other public services after years of cuts. Prop. 30 provided space in the state budget to begin restoring funding to services outside of K-14 education. It did this by generating additional tax revenues that helped to fund the state’s share of the Prop. 98 guarantee, which in turn freed up General Fund dollars to support other services outside of K-14 education. Boosted rainy day fund deposits and debt repayment. Prop. 2, approved by voters in 2014, requires the state to set aside at least 1.5 percent of General Fund revenues each year to both build up the state budget reserve and pay down budgetary debt. By increasing state revenues, Prop. 30 helped to boost deposits into the state’s rainy day fund and payments that reduce state debts. In 2016-17, for example, the state set aside $2.6 billion for Prop. 2 requirements and made an additional $2 billion deposit into the rainy day fund. These contributions would likely have been smaller in the absence of Prop. 30. Prop. 30 raises a significant amount of revenue. In 2016-17, Prop. 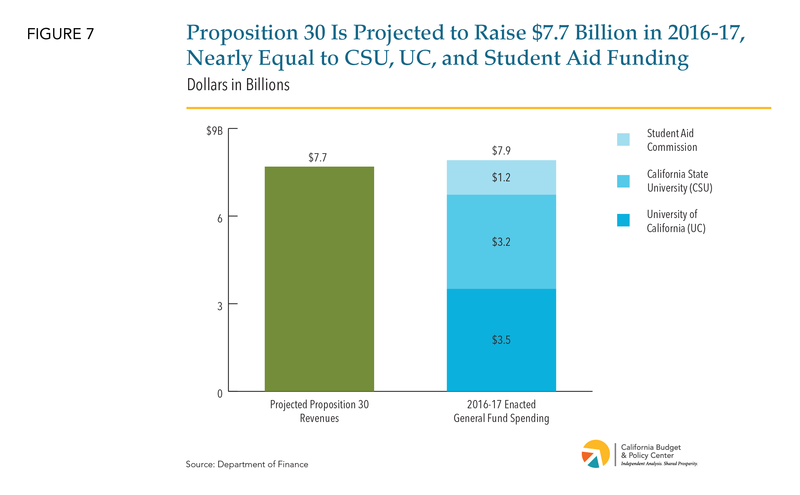 30 is projected to raise $7.7 billion — nearly equal to General Fund spending in the 2016-17 budget for the California State University (CSU), University of California (UC), and college financial aid combined ($7.9 billion) (Figure 7). Alternatively, for more context on how much $7.7 billion represents, funding for key services and supports for seniors and people with disabilities is about $9.6 billion in the 2016-17 budget. This figure reflects combined General Fund support for the Supplemental Security Income/State Supplementary Payment (SSI/SSP) Program, which helps low-income seniors and people with disabilities to pay for rent, food, and other necessities; the In-Home Supportive Services (IHSS) Program, which helps low-income seniors and people with disabilities safely remain in their own homes rather than having to rely on more costly out-of-home care; and the Department of Developmental Services, which provides services and supports to people with developmental disabilities. Prop. 30 helped California to begin reinvesting in its people and communities after the cuts made during and following the Great Recession. The looming loss of Prop. 30 revenues means California policymakers and voters must figure out how to fill the gap or face difficult choices about which public services and systems to prioritize and which to reduce or eliminate. One initiative on the November 2016 ballot, Prop. 55, would maintain Prop. 30’s PIT rate increases beyond their scheduled expiration in 2018. In the forthcoming second part of this Budget Center series of briefs, we will discuss what Prop. 55 would do and what it would mean for the state.